In this article, The Truth About Chironomids Part Two, the popular "quick-strip technique" for fly fishing with Chironomid imitations is discussed in detail. In the previous article, The Truth About Chironomids Part One, Carol discusses some truths about fishing deep with Chironomids. Floating line, strike indicator, and weight on the leader or a bead-head fly. Determine the depth of the lake where you are fishing (see the section on "How Deep Do You Go?" later in this article to help you determine lake depth), and position the strike indicator so the fly is suspended one to two feet off the bottom of the lake. Use a bead-head Chironomid pupa imitation or place split shot or putty weight ten to twelve inches above the fly. Either of these options work equally well. Use a knot in the tippet to hold the weight in place. Cast the fly directly downwind from the boat. Wait about one minute for the fly to sink down into the strike zone, one to two feet off the bottom of the lake. It is best to time it so you are sure that the fly is deep enough. With the rod tip on the lake's surface, and the line taut, make four to five quick strips with the line. The strike indicator should make a wake on the surface, and travel two to three inches per strip. Wait ten seconds between each set of strips. Be sure to work the fly right up to the boat; it isn't unusual to get a strike right next to where you are anchored, since the trout often follow the fly. Peter has seen a number of fishermen pick up their line too soon, and miss strikes. He also notes that it isn't important to cast out a long distance from the boat, since most fish are caught within an easy cast right around the area where you are anchored. causes trout to strike instinctively. Peter also gave us a tip for determining the depth of a lake—clamp a hemostat to the hook bend (just one click, if you clamp down more, the hook might break), and then lower the fly to the lake floor. When it touches the bottom the line goes slack. Move your strike indicator so that the fly floats one to two feet off the lake bottom. Leave the hemostat on the hook, adjust the indicator, and keep testing until it is positioned where you want it. Then remove the hemostat, and you're ready to make your first cast. Strike Indicators...Which Ones Are Best? We prefer to use corkies for strike indicators. They are easy to move once they're placed on the leader, and they won't get water-logged. the larger indicator on the right. 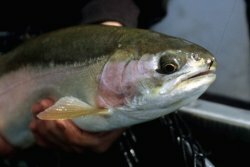 We use mainly the smaller sizes, half an inch in diameter, but Brian Chan, British Columbia's fisheries biologist for over 25 years and an expert on Chironomid fishing, has suggested using larger ones instead. The larger size floats consistently on the surface, and wave action moves the fly in a way that mimics the natural. Subtle takes by trout will be harder to see with a larger indicator, however, so both sizes are worth considering. 1. Determine the depth of the lake where you are fishing, and position the strike indicator so that the fly is floating one to two feet off the bottom. 2. Cast the fly at a right angle to the wind. 3. Wait for the fly line (and fly) to drift until it is directly downwind from the boat. 4. Once the line has completely straightened out downwind, start a very slow retrieve with pauses, barely moving the indicator. 5. When the indicator nears the boat, pick up the line and cast it out again. 2. Cast the fly downwind from the boat. 3. Wait one minute for the fly to sink into the strike zone, one to two feet off the lake bed. 4. With the rod tip on the lake's surface, and the line taut, make four to five quick strips of the line. 5. The strike indicator should make a wake on the surface, and travel two to three inches with each strip. Wait 10 seconds between each set of four to five strips. 6. Work the fly right up to the boat, where trout often strike, before you pick up the fly to recast. full of chironomid pupa patterns. 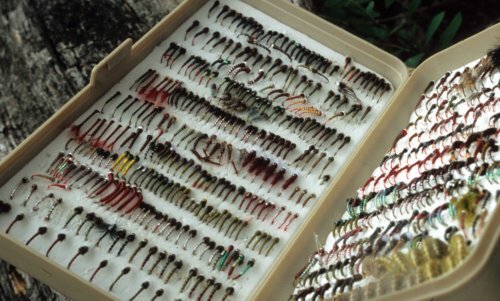 In the last segment of this article, The Truth About Chironomids Part Three, the major characteristics, life cycle, and behavior of Chironomids are discussed to help you understand why these insects are one of the most important sources of food for trout in lakes. It concludes with three hot chironomid pupa patterns recommended by the experts.